Keeper: a. An attendant, a guard, or a warden. b. One that has the charge or care of something. 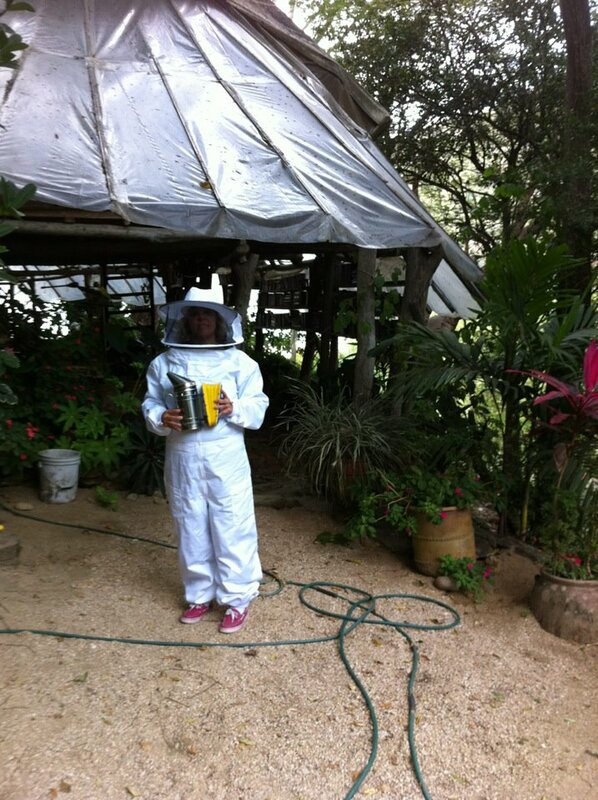 Yesterday my bee mentor, Jerry, and I (with Mateo documenting) donned our suits, smoker, calm attitudes, and extracted the masks, and a small amount of honey from our trunk of bees in the topanco. It's a weird thing to be so close to so many little stingy creatures and not feel any fear. It's liberating and truly awe inspiring. I find that I love these bees more than I could imagine. I think I always had the love somewhere but this experience has solidified it into something tangible. We first smoked the entrance then opened the lid. I held it open while he smoked the hive. We began to extract the masks carefully. They had already began to attach propolis to a couple of the masks, to start building the hive onto them. I am amazed at how fast they work. Jerry said they had built a few more combs in the few days he'd been here. We then smoked them a bit more and went for the combs. Jerry took a scraper tool and cut two combs from the top of the box. We brushed the bees off into the box and closed it carefully. We had to smoke and brush some more bees off the combs then went back down stairs. Mateo all the while about 10 feet away, not wearing a suit mind you, and safe. We removed our suits, sat at the table, and tasted the first of our jungle honey. It was sweeter than any honey I've ever tasted...but I might be biased. They are my bees after all, or rather I am their keeper. Next task is to move them to their new spot which we may do tonight. I hope they like it and are happy and productive, as I strive to be as well. This makes me so happy I feel a little weepy! What an amazing experience, I'm so happy for you! Have you seen Jerry Seinfeld's "The Bee movie,"? It's great...Check it out if you can.